Fiber is an important part of any healthy diet. Although fiber is mostly known for improving digestive health, studies have also shown that certain types of fiber can also help lower your cholesterol levels. This can include common brand name fiber supplements like Metamucil and Citrucel. There are two types of fiber that are incorporated into various fiber supplements: soluble and non-soluble fiber. Soluble fiber can be further divided into two types: nonviscous and viscous. Viscous soluble fiber becomes a thick gel when it comes in contact with liquids in the digestive tract. Due to this characteristic, this type of fiber can bind to cholesterol in the small intestine. This prevents its absorption into the bloodstream and allows it to be eliminated in the feces. Insoluble fiber and nonviscous soluble fiber do not possess the ability to bind to cholesterol in the small intestine. Fiber supplements are available over the counter in your local pharmacy, grocery store, or health foods store in the form of a tablet or powder. Two types of supplements containing soluble fiber have studies supporting their effectiveness in slightly reducing LDL cholesterol levels. Other types of widely-available fiber supplements may not be as effective in lowering your cholesterol. Psyllium. Psyllium is a type of viscous soluble fiber found in a variety of whole grain foods. It is also found in supplements such as Konsyl, Metamucil, and various store brands. Psyllium has been the most extensively studied soluble fiber, either administered alone as a supplement or included in a variety of grains. Studies have shown that doses anywhere between 5 and 15 grams per day were able to lower LDL levels between 5 and 20 percent. Triglyceride and HDL levels were not significantly affected in these studies. Methylcellulose. Methylcellulose is a modified form of cellulose. It is found in fiber supplements such as Citrucel and various store brands. This viscous soluble fiber does not have as many studies as psyllium that support its use for lowering cholesterol. However, the few studies that have examined methylcellulose state that an average of 5 grams per day could reduce LDL cholesterol levels by about 8 percent. HDL and triglyceride levels did not appear to be affected in these studies, either. There are other soluble fiber supplements that do not have studies in place to support their use in lowering cholesterol levels. These can still be used for digestive health. Polycarbophil (Products: FiberCon, FiberLax, various store brands) - Polycarbophil is a form of soluble fiber. Studies have not been able to show that it can lower LDL cholesterol in comparison to psyllium and methylcellulose. Wheat Dextrin (Products: Benefiber, various store brands) - Wheat dextrin is a nonviscous form of soluble fiber. It is not able to form a gel-like material within the small intestine and therefore cannot bind cholesterol. The American Heart Association recommends consuming at least 25 grams of fiber daily. If you are unable to get enough fiber into your diet, taking a supplement may seem like a good solution. However, you should not rely exclusively on supplements for fiber. There are plenty of delicious, fiber-rich foods that you can incorporate into your diet. These not only supply you with the fiber you need, they can also introduce additional vitamins and other nutrients to your meals. You should always consult with your physician before adding fiber to your cholesterol-lowering regimen. When using fiber supplements, follow the directions on the packaging. Fiber supplements should be taken with a whole glass of water in order to prevent choking. The doses should be divided throughout the day in order to reduce some of the gastrointestinal side effects associated with taking fiber. These can include abdominal cramping and bloating. 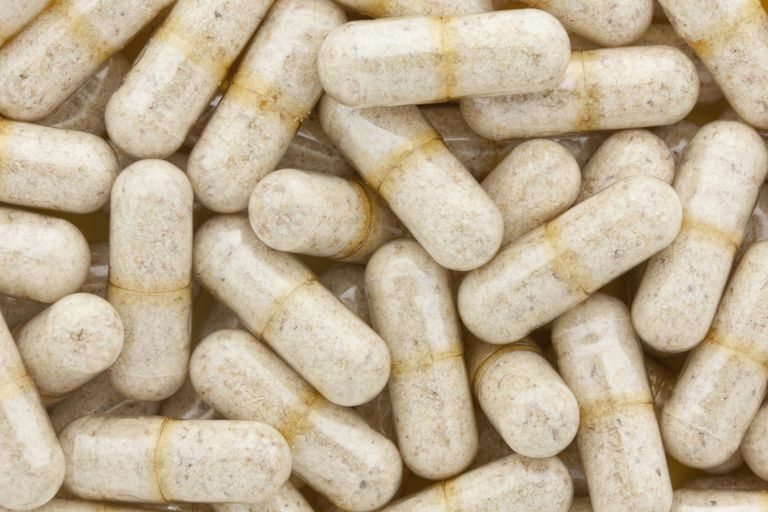 Unless otherwise stated by your physician or pharmacist, you should not take fiber supplements around the same time as you take certain vitamins and other medications. Fiber may lower their effectiveness. Anderson JW, Baird P, Davis RH, et al. Health Benefits of Dietary Fiber. Nutrition Reviews. 2011;64:188-205. Chutkan R, Fahey G, Wright WL, et al. Viscous Versus Nonviscous Soluble Fiber Supplements: Mechanisms and Evidence for Fiber-Specific Health Benefits. Joun 2012;24:476-487. American Heart Association. Whole Grains and Fiber. 2016. Can I Use Fiber Supplements to Lower My Cholesterol? Does Insoluble or Soluble Fiber Lower Cholesterol? Can Eating Sesame Seeds Control Your Cholesterol Levels?